Some of the tracks aren't strictly Bono solos and there's one that's not even sung by him. I compiled the 5th CD on my own since I had a bunch of extra songs that were just lying around on my computer. I'll send it to you right now!! i bet it was left in her stereo and one of my parents saw it and just put it somewhere else. they still do not know how to take care of cds or dvds. i see them just lying around, out of their cases. i don't care if they treat their own that way, but in some cases they are mine. and i take pride in how i take care of my belongings. the only cds of mine that are probably scratched are the ones i've owned for like 10 years. I just ate a Tim-Tam... spooky, no? what exactly is a tim-tam? no one's ever told me. Damn! I watch the local news here for the first time in a couple of weeks and who do I get....Ben not Sexyweather man Jym. Well I'm assuming those three guys in his back-up band do some solo work every now and then too. Or do I have the completely wrong idea about the whole thing? I probably have a bunch of the songs anyway. Is it worthy trying to find/tempting you with various dvd's to get my hands on it? Jym always tells you yt's gonna snow, anyway. Jym = wynter. Yt's been awhile synce Y spelled thyngs wyth y's! 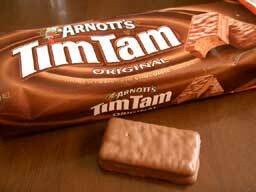 Tim Tam's are over rated.